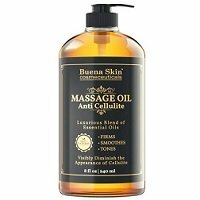 I give Buena Skin Anti Cellulite Massage Oil 1.5 out of 5 stars. It’s really inexpensive and uses natural ingredients without parabens, sulfates, etc. It also smells good and has a light, citrus-y essential oil aroma. So those are pretty much the only areas I like. The application process is just too much for me! It’s such a hassle, super messy, and takes forever. The oil refuses to absorb into your skin, even right after showering and rewetting my skin. And once you get the oil rubbed in as best as you can, it sits so heavy. It’s greasy and sticky and makes you attract dust, dander, and debris. It also takes a good 20-30 minutes to dry. So I wasn’t a fan of walking around like a wet, sticky mess. My skin did feel softer, hydrated, and healthier. However, it had less than average results for helping diminish the appearance of my cellulite. Overall, just not my cup of tea and not worth it to me! This product is an oil that has a yellow tint to it and is very runny and slick. It reminds me of a super liquid-y olive oil. The main reason I don’t like oils is because the application is usually a nightmare. Unfortunately, this one was no different! It’s super messy and annoying to apply. The directions say for maximum results, apply the massage oil on damp skin after taking a shower or a bath to lock in moisture. It says oil applied to dry skin will coat the skin but not penetrate. Then it says to massage into your skin until fully absorbed. So I followed the directions perfectly each time but the vast majority of my attempts ended in disaster. I applied it right after showering and purposely didn’t dry my problem areas off and made sure they still had water on them. I applied the oil and it just would NOT absorb. I literally had to rewet my booty, legs, hips, etc., which was also super messy. You basically have to be soaking wet for it to penetrate and you can definitely feel when it’s too dry. But regardless, it never really felt like it absorbed easily. It mostly felt like it was just sitting heavy and greasy on my skin. YUCK. And to add to the mess, the pump on the bottle shoots out the liquid-y oil super fast and it gets everywhere. For some reason it’s really hard to pump a small amount out. My goodness, this oil takes a very long time to dry. I’d say anywhere from 20 to 30 minutes solid. And it even took longer sometimes. The worst part is that the oil makes your skin SO sticky. Fuzzies, hair, and small animals… you name it. It just feels heavy and gross on your skin while it’s drying, so I’m not a fan. In the bottle, this oil has a pleasant smell. It reminds me of a super faint smelling Pledge. There’s a citrus scent to it because it has grapefruit and lemon oils in it. The smell starts to fades away a little while after applying. I did notice one main short term result. My skin definitely felt softer when the oil would actually absorb into my skin. Other than that, I didn’t notice any other short term changes. After using this massage oil for a while, I noticed some results. I could tell that my skin was more hydrated and just felt healthier. This product states it helps firm, smooth, and tone to visibly diminish the appearance of cellulite. Unfortunately, this product produced less than average results compared to other cellulite products I’ve tried. So that’s definitely a bummer. This anti cellulite treatment oil has 4 ingredients, all of which are essential oils: Grapeseed Oil, Eucalyptus Oil, Lemon Oil and Grapefruit Oil. I do like that it only contains natural ingredients because some cellulite products definitely pile on the nasty chemicals and questionable ingredients that you can’t even pronounce. This massage oil is free of parabens, sulfates, and phthalates. So that’s always a great plus! Here’s the breakdown of each ingredient and how they might help. Grapeseed Oil has astringent qualities that may tighten the skin. It’s naturally hydrating and helps moisturize the skin. It’s also regenerative, which may help reduce the appearance of cellulite. Eucalyptus Oil has anti-inflammatory properties that may help soothe irritated skin while giving a cooling, refreshing tingling sensation that may possibly lower tension and stress. It’s also believed to directly affect the fat deposits right under the skin and potentially helps protect your skin. Lemon Oil is thought to enhance circulation by strengthening blood vessels, may aid in preventing the build up of lymph and water retention. This may help tighten the skin and reduce varicose veins. Grapefruit Oil is another popular cellulite buster because it’s suggested to help fight and break down fat by stimulating the metabolism. It’s naturally rich in super beneficial antioxidants and anti-inflammatories that may protect and nourish your skin. Buena Skin touts that their 100% natural proprietary “d-limonene” formula targets unwanted fat cells in problem area. D-limonene is found in lemon and grapefruit and is packed with Vitamin C and the anti-oxidant Lycopene, which may help detoxify and cleanse the lymphatic system, thus helping banish cellulite. On their website, you can buy this anti cellulite massage oil for $15.95. You get an 8-ounce bottle, so it works out to just $1.99 per ounce. The bottle lasts for a while, too. 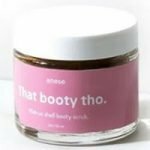 I used it on my booty, hips, belly, arms, and thighs and it lasted me a good month. Buena Skin offers a no risk 100% Satisfaction Guarantee on their website. If you’re unsatisfied with the products you have purchased from Buena Skin®, they offer a 60 day 100% money back guarantee. I actually didn’t think they were going to have a guarantee, so I’m happy to see they have one! To buy Buena Skin Anti Cellulite Massage Oil, click here.